When it comes to breakfast + brunch, I almost always choose a savory option over a sweet one. Show me a menu full of delicious-sounding pancakes + french toast? I’ll hop down to the omelettes + quiches, where I’ll choose something that sounds even tastier. There *is* one thing that can make me wander to the sweet side, though — a truly scrumptious coffee cake. This stems from my childhood, when my parents would start the weekend by picking up amazing New England bagels + my favorite breakfast treat — a sour cream chocolate chip coffee cake. I hadn’t thought about that coffee cake in years, until I had some sour cream in the fridge to use up + stumbled across a sour cream coffee cake recipe. Suddenly, i remembered that treat from my childhood + had to recreate it. I found a recipe, gathered the ingredients, + was so excited that I couldn’t wait til the morning to make it, so I began baking it at 10 PM that evening. As it was baking, I knew i was onto something fab – it already smelled like that coffee cake I loved so much – I couldn’t wait to sample it. So, how was it? Absolutely, positively delicious. I’ve eaten an insane amount of this coffee cake in the mere 3 days since I baked it. It makes for a delicious breakfast, a perfect afternoon snack, or a wonderful after-dinner sweet. The cake is buttery + flavorful, while the chocolate/ cinnamon-sugar ribbon is rich + decadent. And my favorite part? The divine cinnamon-sugar crumble topping, intermingled with cinnamon-sugar coated chocolate chips. Holy deliciousness! If you’re looking for a serious crowd-pleaser for your next breakfast or brunch, look no further! preheat the oven to 350°. butter an 8-inch square baking pan + set aside. in a medium bowl, whisk together the flour, baking powder, baking soda, + salt. set aside. using an electric mixer or a stand mixer, cream together the butter + 1 cup sugar until fluffy, about 5 minutes. add in the eggs, one at a time, + beat until smooth. beat in the sour cream + vanilla extract. mix until well combined. slowly add in the dry flour mixture. mix until just combined. in a separate small bowl, make the cinnamon-sugar topping/filling, by whisking together sugar, brown sugar, + cinnamon. 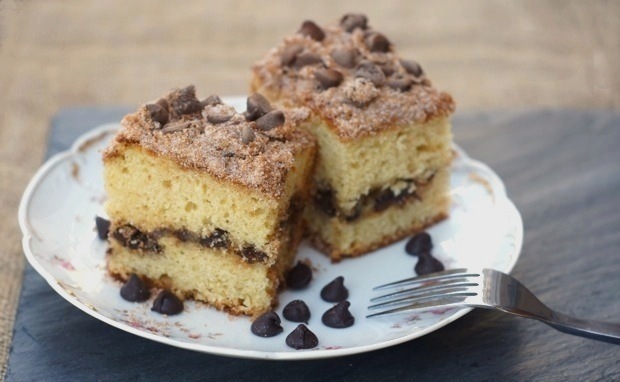 prepare the coffee cake: pour half the batter into the prepared cake pan, then sprinkle with half of the cinnamon-sugar mixture + half of the chocolate chips. spread the remaining batter over the filling, spreading gently. top with the remaining chocolate chips + cinnamon-sugar mixture. bake until the top is golden + a toothpick inserted in the center comes out clean, about 40-50 minutes. cool to room temperature + serve. I love sour cream coffee cakes! This one looks especially nice with the addition of chocolate chips. I’m happy you linked to this! I’ve bookmarked it. I made this for co-workers with Peruvian Organic coffee from Cape Cod Coffee Roasters. Delicious and easy to put on a plate for work. I just made this and all I can say is that it turned-out perfectly! I made a gluten-free version. I used my own g-f flour mix (rice, potato, soy) and 1 tsp of xanthan gum instead of regular wheat flour. I didn’t have any sour cream so I followed a recommendation of another poster and used yogurt. All I had was vanilla yogurt and it was wonderful! Thank you! Next post: month 1 recap – my 2012 cooking goal!